Experience a personalised skin assessment using state of the art VISIA technology. 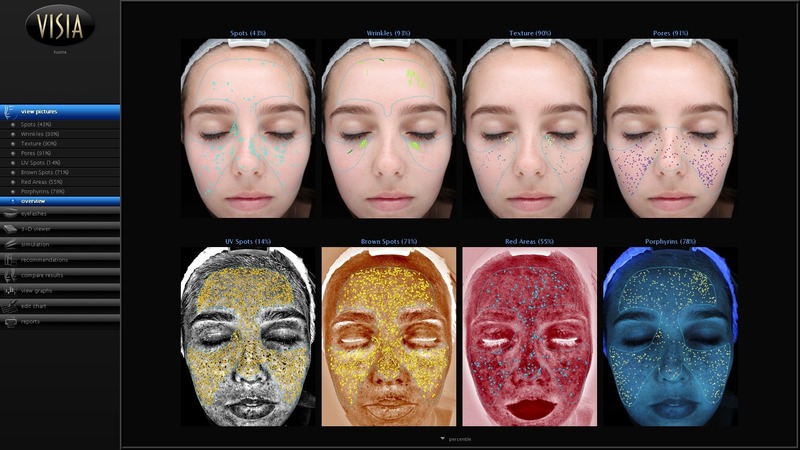 This technology helps to show us your unique skin-colour signature so we can give you better, more-informed advice as to appropriate treatment. IntelliFlash®, cross-polarized and UV lighting are used to record and measure surface and subsurface skin conditions. UV photography provides the most complete data set available for sun damage assessment and analysis. Typically brown or red skin marks, distinguishable by the distinct colour and contrast from the background skin tone. Spots vary in size and shape, and are normally visible to the naked eye. Furrows, folds and creases in the skin that can increase as a result of sun exposure and are associated with a decrease in skin elasticity. Raised and depressed areas that indicate variations on the skin surface affecting the skin smoothness. Circular surface openings of sweat gland ducts. Due to shadowing, enlarged pores appear darker then the surrounding skin tone and are identified by the darker colour and circular shape. The absorption of UV light by epidermal melanin just below the skins surface results in the display and detection of UV spots that can result from sun damage. Bacterial excretions that can become lodged in the pores. The Visia skin analysis is included in your initial skin consultation ($50) with Dr Holmes. Any additional analysis that may be required after skin treatments will be complimentary.